Fremont Fire officials rescued an elderly man trapped in a well on Saturday morning. Roz Plater reports. 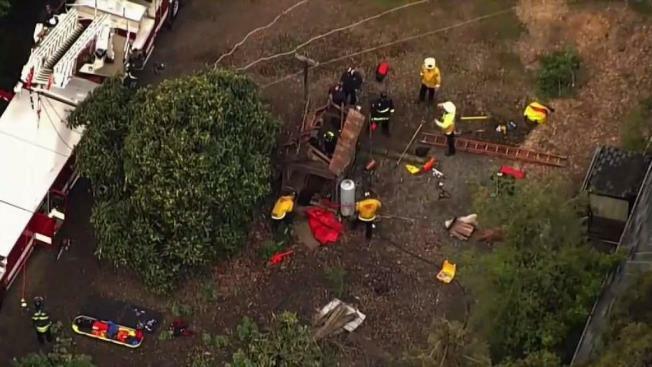 Fremont Fire officials rescued a 92-year-old man trapped in a well on Saturday morning. According to officials, the elderly man fell about 26 feet down the well full of water at approximately 10 a.m. The man is currently conscious but has a long list of medical conditions. "I was worried like the devil," said friend Richard Coulter. "He's my best friend and there was nothing I could do, you know?" The incident occurred at Driscoll and Mission Streets in Fremont at an older farm residence — the man in the well is thought to be the original landowner. It was reported that the man and his daughter were gardening when the incident occurred. At around 10:30 a.m., his daughter went inside the house when the man went to the well to check the water levels. "He didn't come in the house so she went looking for him and there he was in the bottom of the well," Coulter said. "Just colder than an ice cube." Officials say the floor of the hundred-year-old pump house just gave away. "We found him up to his neck in water," said Battalion Chief Gary Ashley. "He was clinging to the sides of the wall because we could not find the bottom." Firefighters used a ladder truck rig to lower a rescuer into the well, fitted with a harness, and carrying a helmet and life jacket for the victim. They were able to hoist him up and once out, he was taken to the hospital. "He's got numerous lacerations to his head and arms," said Ashley. "He's very lucky given the extend of the fall."